Antonio Suárez Salazar, "Guadiana", Badajoz, 1955. Spanish flamenco Singer. The dynasty of flamenco singers of the Porrinas has one of its most steadfast representatives in Guadiana. And he’s a chip off the old block: Antonio Suárez is the brother of Ramón el Portugués, nephew of Porrinas de Badajoz, cousin of La Negra and Juan Salazar... He was barely sixteen when he debuted in the Madrid tablao, Café de Chinitas. 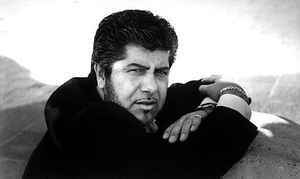 During the eighties he devoted himself to singing in tablaos such as Torres Bermejas and Los Canasteros. Guadiana is one the most sought-after singers to accompany flamenco dance. El Güito, La Tati, Javier Barón, La Tolea and, more recently, Merche Esmeralda and Antonio Canales for whose company he often composes. His collaboration has also been requested by international companies such as that of singer Enrique Morente or guitarists such as Pepe Habichuela who includes one of his cantes on the record Yerbagüena (Nuevos Medios, 2001). The singer from Badajoz recorded ‘Cuando el río suena’, his first record, in 1999, with Nuevos Medios, the same company with which he prepared his second work, ‘Brillo de Luna’, released in May, 2002. Guadiana is also open to new musical experiences as demonstrated by his participation in ‘Chanson Flamenca’, a project in which a long string of singers lends a flamenco interpretation to French ‘chanson’.